Discover the advantages of induction heating! Hot forming is a process in the manufacture of industrial fasteners such as bolts, screws and rivets. Heat is used to soften the metal which is usually a sheet, bar, tube or wire and then pressure is used to alter the shape of the metal by performing any of the following operations: hot heading, blanking, punching, slotting, perforating, trimming, shearing or bending. Besides, billet heating is also a process best performed with induction hot forming. Modern induction heating provides many advantages over other heating methods and is commonly used for bonding applications. Heating through induction provides reliable, repeatable, non-contact and energy-efficient heat in a minimal amount of time. 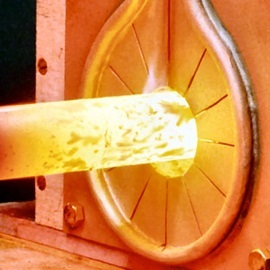 Induction heating is also ideal for in-line production processes because of its ability to produce repeatable, rapid and accurate heating cycles. Ambrell has offered cutting-edge hot forming solutions since 1986. Our engineering expertise in developing hot forming solutions has benefitted many manufacturers across different industries worldwide. In order for the hot forming process to succeed, an application should be tested including the following variables. Ambrell's experienced applications engineers will provide you with the necessary advice and recommendation.